Want to be hired by Brian? 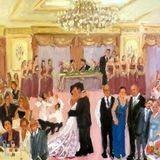 I am getting marring on Feb. 22nd and we would like someone to come and paint a picture of the reception as it is taking place. The idea is that it will be fun for the guests to check in and see how the painting is coming along throughout the reception. You will need to complete the painting over the course of a 3 hour window from roughly 6:30pm to 9:30pm. People will be stopping by to see the progress, so you need to be OK with visiting guests asking questions and chatting. You will provide all necessary equipment and supplies to deliver the finished product. Pay is $150 for the three hours of work.